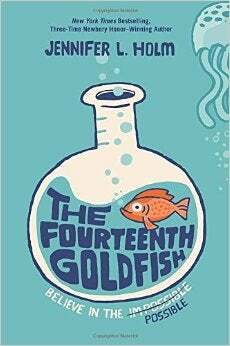 The Fourteenth Goldfish is a rare children's book. It presents a message that plenty of people will disagree with - and argues that they should be free to disagree with it. Get ready to argue with your kids about what they're reading. Today's books, although rich in high-tech gadgets and youthful rebellion, have begun reminding me of rather prim Victorian stories about nice young ladies and gentlemen. Yes, their aesthetics are different, but the unspoken message is the same—nothing interesting ever happened to someone who was over nineteen years old. Once out of childhood, the window for adventure and opportunity closes. The Fourteenth Goldfish, by Jennifer Holm, may be an antidote to this kind of thinking. Although, as a children's book, it is about an eleven-year-old girl named Ellie, it wholeheartedly advocates growing up. Ellie isn't much in favor of the idea at first. Having just flushed her thirteenth goldfish down the toilet and started out middle school, she's dead set against change. As it turns out, she's an amateur compared to another member of her family. Her grandfather, Melvin, is a scientist who has been studying the regenerative properties of jellyfish. He's just done some regenerating himself. Ellie's free-spirited mother now has two children to raise, and one of them is still trying to raise her. Sharing a house with her re-adolescent grandfather gives Ellie some perspective on life. She wonders what the world will look like when everyone goes to go back to puberty as soon as they reach a certain age. She sees how very much Melvin has alienated himself from all the rest of the world by being an adult in a child's body. And, hanging out with him, she realizes what's really involved in growing up and growing old. All the things that Melvin finds so painful—including the loss of his wife—give Ellie a reason to look forward to the future. She wants to learn, to change, to see what the world will be like for her when she gets to be older. Slowly, she even decides that she wants her chance at being one half of a grumpy old married couple. And so the debate with Melvin about the future of the world begins. Some readers will take Ellie's side. Some will take Melvin's. Either way, the book will provide them with quite a lot of material to back their case.